Physician leadership? With frequency, I get asked about the concept from other physicians, providers, patients, community leaders, hospital leaders, and the list goes on and on. Where are the physician leaders? What does it mean? What does it look like? Who is going to lead health care in the future? By the nature of our profession we are leaders. Leaders in health care and wellness. Civic leaders. Church leaders. People look to us to lead. Does that mean we have the skills and tools to be effective? Some would argue quite the opposite. We spend so much time on memorizing anatomy and physiology and pathology and staring through microscopes, that we miss the happenings in the real world, to focus on becoming healers. Are healers that much different than leaders? Leadership is the psychology of managing people, evaluating what needs to get accomplished, and how to put the right group of people together to accomplish you goal. Leaders define the culture to transform a group to success. Physicians know the needs of the patients better than anyone else. What keeps us from taking on leadership positions? We get pulled in multiple directions. Our priorities become our patients, families, golf league (tongue in cheek.) We turn into firefighters that put out crisis after crisis, to survive the day. We are fearful of not knowing the right answers about the future, while striving to have the right answers for every patient, every day. Today exists a greater need for physician leadership than ever before. The landscape is changing daily. Do we want to lead that change, or conform to meet its demands? Health care needs physician leaders, communities need physician leadership. There are opportunities about you if you are interested. From Physician Organizations to Community Boards to Physician Advocacy Groups. NPO has had a significant growth in physician participation to help direct the needed change in health care, to return our focus to the patient-physician relationship. If you are interested in participating in a committee or offering support in any way, please contact us. Our vision is the quadruple aim-improved patient care and quality, improved patient experience, reduced cost of care to our patients, and returning the joy of practice to physicians. Last year I spent four intensive, 5-day weekends at Northwestern’s Kellogg School of Business, in a program for Physician CEOs. Through the 16-hour days, their masterful professors connect the dots of effective leadership, culture building, financial acumen, and business plan development. If anyone is interested developing their leadership skills, I would highly recommend this program. I am sure other leadership programs, MBA programs, MHA programs would help in developing your potential, as well. So, when you ask me what physician leadership looks like, my response- look in the mirror. You are a physician leader. 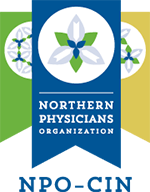 Nathan March DO, FAAFP, is president of Northern Physicians Organization and Medical Director for Northern Michigan Health Network. 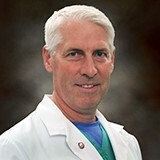 Dr. March is a family practice physician practicing at West Front Primary Care.